Living transplants in Mainland China differ from those in the rest of the world. In China, it is common practice to excise whole vital organs from living sources. Extracting a whole vital organ kills the donor. In medical papers published by doctors from these hospitals, donors are often described as “free of hepatitis, fatty liver, malignant tumors and chronic disease with no long-term medication history or history of alcohol consumption.” Most of these papers cited warm ischemia times (WIT: the period of time from circulatory arrest to perfusion of the organ) of less than 10 minutes, with some even listed as 0 minutes, and the majority of organ sourced from “brain-dead donors,” “cadavers,” “non-heartbeat cadavers,” and “healthy young cadavers.” We list a few examples. Organs are transplantable only when the time and location of a donor’s death are known in advance and the organ procurement team is well prepared. Thus, vital organs from those who have died outside of a hospital (e.g. in car accidents) are not viable for transplantation. Regardless, organs with warm ischemia times of 0 to 5 minutes from “no-heartbeat cadavers” have become a common source of transplants in China. For decades, brain-dead donors have been the main source of transplant organs outside of China as such organs have the shortest warm ischemia times possible. Because Chinese tradition requires bodies to be preserved intact after death, China has neither brain death legislation nor significant voluntary organ donation. Donations after cardiac death (DCD) were another commonly listed organ source in China’s transplant centers. Warm ischemia times of 0 to 5 minutes with “no-heartbeat cadavers”13 have become a standard practice of Chinese transplant doctors. However, there have been few recorded DCD donors despite pilot programs to expand this type of procurement. Although the Ministry of Health and the Chinese Red Cross launched the Human Organ Donation Pilot Program (DCD) in March 2010, many regions have not actually received any donations over the years. The Red Cross stated that, in the two years after DCD pilot program was launched, China completed 207 donations after cardiac death.14 Divided among the more than 147 participating hospitals, this is equivalent to less than one DCD case per year per hospital. Between 2003 and August 2009, only 130 citizens successfully donated their organs after death in Mainland China.22 This translates to fewer than 30 donations per year.23 The number of livers used by the Tianjin Organ Transplant Center alone has exceeded the number of citizen organ donations in all of China. 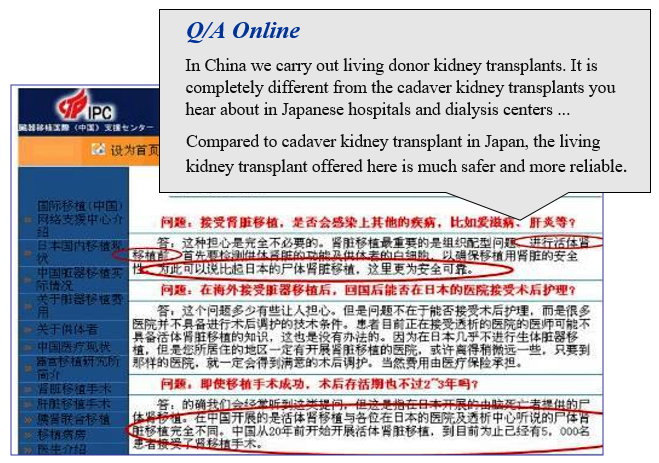 "China International Transplantation Network Assistance Center (CITNAC) Online Answers"
"Introduction to the Liver Transplant Center of the PLA Military General Hospital of Beijing"
"Treatments for Biliary Complications of Liver Transplantation Source: China Modern Medicine, 2009 Vol. 16, Iss. 4 p.12-14 Authors: Qing Jianjie, Xia Yongxiang, Wu Zhengshan, Zhang Feng and Wang Xuehao"
"The impacts of surgical procedures to the liver function during perioperative following liver transplant China General Practice2007 Volume 10, Issue 23, p.1947-1950"
"231 cases and 240 times of liver transplantation retrospective analysis Source: Shanghai Medical Journal， 2004 Volume 27, Issue 11, p.805-807 Author: Fu ZhiRen, Wang Zhengxi"
"Chinese Journal of Hepatobiliary Surgery Chinese Journal of Hepatobiliary Surgery 2007 Volume 13, p.132-133"
"Organ donation encountered difficulties: constrained by death criteria"
"The Ministry of Health Conference on Organ Transplantation Center in October Source: Xinhua net August 13, 2005"
"No brain death regulation in China, 90% of doctors are not clear about the specifications either qq.net August 22, 2014"
"First brain dead donor lung transplant successful Source: ycwb.com July 25th 2006"
"Dead Child Donated Organs that Saved Three Lives Source: Legal Evening News Sept 10th, 2006 Author: Yao Yi"
"Clinical application of lungs from brain death donor harvested by international standardized methods Source: Organ Transplantation July 2010 Issue 4, P. 230-233 Authors: Weidong, Chen Jingyu"
"Evidence of Live Organ Harvesting of Falun Gong Practitioners Collected from Chinese Medical Papers"
"Organ Donation Pilot Program did not Solve the Dilemma of the Supply and Demand Disparity After Two Year Trial Source: New Beijing Paper March 26, 2012"
"Our province completed the first DCD donation Source: Health and Family Planning Commission of Heilongjiang Province Heilongjiang Daily June 08, 2015"
"Fujian province completed the first DCD heart transplant reviving a heart in 37 minutes Source: Dongkuai Net May 06, 2015"
"The No.81 Hospital completed the first DCD donation of Nanjing Military Command Source: Dongkuai Net May 06, 2015"
"Dongfeng General Hospital completed the first DCD liver transplantation in the Northwest of Hubei Province Source: Dongfeng General Hospital Website July 14, 2015"
"Precautions and Related Issues Analysis of Quick Liver Extraction Source: Tianjin Medical Journal 2009 Volume 37 Issue 9 p.793-794 Authors: Cheng Litian, Shen Zhongyang etc." "Shen Zhongyang Source: Ho Leung Ho Lee Foundation"
"Explore and Innovation Cast Brilliance – on Organ Transplantation department of the First Clinical College China Medical University Paper, 2005 Edition 126 December 27, 2005"
"The Way of Legalizing Organ Donation, Huang Jiefu: Stopping the use of organs from executed prisoners starting next year First Financial Daily December 3, 2014 Author: Zhang, Liuchang"
"Mainland China has only 130 donors donate organs in 6 years Source: Chinanews.com 2009-08-23 First Financial Daily December 3, 2014 Author: Zhang, Liuchang"